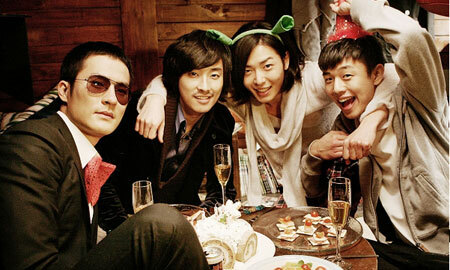 (left to right) Choi Ji-Ho, Ju Ji-Hoon, Kim Jae-Wook and Yoo Ah-In in Antique. Based on a Japanese manga, Antique is all over-the-place with its story and emotions, but director Min Kyu-Dong is able to reflect his source material in a smart, surprising and guiltily entertaining way. Fast-paced, fun and gratefully irreverent. Starring many pretty men and lots of delicious-looking cake. by Kozo: Entertaining and fabulously fruity, Korean film Antique is so deliciously entertaining a moviegoing experience that its flaws are easily excused. Based on the Japanese manga Antique Bakery by Fumi Yoshinaga, Antique was brought to the screen by director Min Kyu-Dong (Memento Mori), and he gives the adaptation a fun and colorful spin perfectly suited to cinema. Min unleashes an array of narrative techniques - split screens, onscreen animation, musical numbers, dream sequences - to tell this fast-paced, sitcom-friendly tale of four impossibly beautiful guys working at the same bakery. Along the way, they change, mature, and help the police catch a child-killing kidnapper. Yeah, you read that right. Ju Ji-Hoon of blockbuster K-drama The Palace stars as Jin-Hyeok, the sweets-hating proprietor of Antique, a patisserie that serves its treats on antique dishware. Seon-Woo (Kim Jae-Wook) is Antique's talented patissier, and is what the subtitles call a "Gay of Demonic Charm", possessing the only-in-manga ability to charm nearly any man, gay or straight, such that they'll go crazy trying to win his favor. Jin-Hyeok is immune to Seon-Woo's charms, which is a holdover from the duo's high school days when Jin-Hyeok famously and rather rudely refused Seon-Woo's confession of love. As fate would have it, the two team up years later to hawk cakes to their sugar-addicted customers, and they do it with style and aplomb, not to mention plenty of failed flirtations from Seon-Woo and verbal abuse from Jin-Hyeok. Joining Jin-Hyeok and Seon-Woo are Ki-Beom (Yoo Ah-In), a young ex-boxer who wants to work at Antique because he can't get enough cake, and Soo-Yeong (Choi Ji-Ho), Jin-Hyeok's burly but shy childhood friend who always wears sunglasses and may be homosexual. All four of the characters have their issues and backstories, and the film introduces them all in fast, furious, and somewhat disjointed fashion. The narrative isn't always coherent; Antique packs in a ton of content into its less-than-two-hour running time, and it does so by moving at a break-neck pace, introducing us to characters and situations through offhand exposition, overlapping dialogue and scenes, and smart pauses to let important moments sink in. Min changes up his pace and tone frequently, but he never pulls the film too far from its fun, unpretentious center. This is only entertainment, and Min never pretends it's anything but, usually getting the most from his light premise and handsome, capable leading actors. The queer content is sometimes flamboyant, echoing the source material's status as nearly a "Boys Love" manga. The film objectifies its male actors exceptionally, and is unapologetic about showing half-naked guys groping each other in a horny fashion. At the same time, the film is okay with Jin-Hyeok hurling homophobic epithets at Seon-Woo, and the film does flesh out its main characters such that they're rendered beyond their obvious bishonen stereotypes. Antique is a movie that has its cake and eats it too (pun intended), with metrosexual male cuddling and off-color insults flying left and right. Add the above to the snappy acting, slick cinematography, and fabricated art direction and you have a fun and sometimes guiltily enjoyable cinema package. Antique is a fast, funny, and sometimes rudely entertaining commercial film that handily adapts its manga inspiration while also creating its own unique identity.